Recorded in 1952, these four titles were probably released on two singles. Scott W. Smith's discography lists just the first two titles. 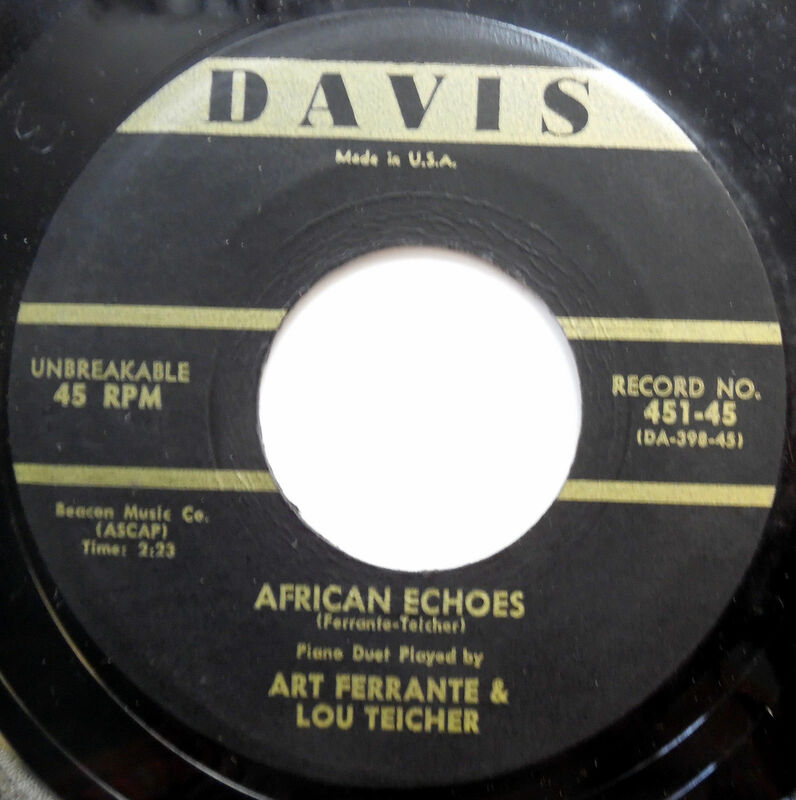 I found a 45 single (Davis 451-45, above) which includes Boogie Express (DA-397-45) and African Echoes (DA-398-45). F&T's first single was used on one of those Guest Star budget LPs. I'm pretty sure that was a Synthetic Plastics, NJ, budget label (Spin-O-Rama, Diplomat, etc.). The first song on each side would have been F&T, with the remainder by a studio artist (in this case it says Philips & Burns with the Metropolitan Strings -- if they actually exist). Page 221: Nearly five months lapsed before Davis reentered the studios. On September 8 , he recorded the popular piano duet of Arthur Ferrante and Louis Teicher, cutting four selections. The duo recorded a far smoother version of "Boogie Express" than Deryck Sampson's original. Their second selection — originally called "St. Louis Boogie" — was recast "Mississippi Boogie" on their contract. Perhaps Davis wished no conscious riding on the coattails of W. C. Handy's "St. Louis Blues." Two very different titles, "High, High, High" and African Echoes," completed the session. Page 291: In the fall of 1962, he leased the four titles he cut with pop and light classical pianists Ferrante and Teicher – for United States rights only – to Synthetic Plastics Record Corp., which had office on New York's 8th Avenue, close to the old Mastertone studios. The interest in leasing Davis's material, however, didn't seem very brisk.